I haven't reviewed anything for what seems like ages and have been losing the will but I've read two fabulous books from Bloomsbury today so wanted to talk about them briefly! This is a short story which I've read before but I had to get my hands on it to see what Chris Riddell's illustrations would add to it - and the answer is LOADS! It was already a brilliant read but the black, white and gold drawings from Riddell make it an absolutely perfect book for your shelf - or for Christmas presents! I always struggle to review shorts because I'm petrified of spoilers and it feels like I'll give something away, so all I'll say on the writing is that it's a great version of a fairytale (or two!) 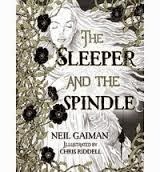 which took me by surprise and is just as beautifully written as you'd expect from Neil Gaiman. Oh, actually, one more thing - this has awesome heroines! Riddell's illustrations are breathtaking and the hints of gold added to the black and white pictures catch the eye beautifully. Jill reviewed for The Bookbag and was also a massive fan, as was Viv at Serendipity Reviews. Jon Mayhew's Monster Odyssey: Eye of Neptune was possibly my favourite yet from an author who's been consistently excellent, with his loosely-linked Mortlock trilogy being big hits with me. I've been meaning to read his second one in the series for ages but keep seeing it when I don't have spare money or having cash and not being able to track it down - until today, when the brilliant Tales On Moon Lane had it in and I bought it from Jen, my favourite bookseller. Slight spoilers for EoN, have tried to avoid anything major. Dakkar and his mentor Count Oginski get viciously attacked by a hideous creature resembling a giant lizard, severely injuring the Count. Trying to track down the lizard's origins, the youngster ends up in a world far below the earth's surface, filled with lizard riders, giants, and another of the Count's evil brothers, Cryptos. Can he find allies and fight his way out? I feel like I should probably string together a coherent review (and I might, at some point, if I put this on The Bookbag), but OMG YOU GUYS THERE ARE GIANT MONSTERS! And people living in the middle of the earth! And historical characters including a girl I've always wanted to read more about, whose name I'll leave you to discover for yourself and the Emperor Napoleon, as well as a welcome returning character from book one. Dakkar - brave, resourceful, and definitely showing signs of being the man he'll grow up to be (Sorry for the crypticness there but saying more would be a BIG spoiler for book one!) - is a fantastic lead, I love the two girls who play a big part in his adventure, and the other allies and enemies are well fleshed out. Seriously, what more do you want in an adventure series? I'm hoping we get loads and loads more books - my only complaint here is that the Count needs to find some extra brothers for our hero to take on, I think he has 7 (or is it 6, with him being the 7th?) and that's NOWHERE NEAR ENOUGH.